What Is the Difference Between Blood Pressure in the Upper and Lower Extremities? Your blood pressure reading is an important way your doctor determines your overall health. If you have a blood pressure reading that is too high or too low, it gives your doctor a clue about certain medical conditions that you may have. Most often, blood pressure is taken in your arm, but it can also be taken in your calf, thigh or ankle. The readings may differ, and once you understand why, you can work with your doctor to get the most accurate blood pressure reading. 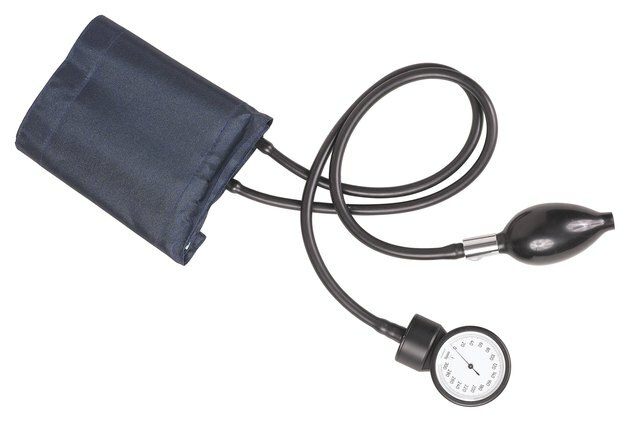 There are two numbers gleaned when a nurse or doctor takes your blood pressure. The top number, or systolic number, measures the pressure in your arteries when your heart beats. This number is the higher of the two numbers in your blood pressure reading. The bottom number, or diastolic number, measures the pressure in your arteries between two heartbeats. A normal blood pressure is a top number that is less than 120 mm Hg, or millimeters of mercury. A bottom number that is less than 80 mm Hg is also considered normal. Higher or lower numbers may signal a health problem. Your blood pressure reading does not usually differ significantly between the lower and upper extremities. It is more likely that you will get a greater difference between arms than between an arm and a leg. In certain health situations, a comparison between an upper and lower extremity blood pressure reading can be helpful. According to the "Journal of the American College of Cardiology," a blood pressure reading from a lower extremity may be more useful in assessing cardiovascular health risks. Another explanation for slightly different readings is your body position. Your arm is closer to your heart than your leg, and this may result in a small difference. Certain heart problems can also cause differences in readings. An inappropriate size of blood pressure cuff may also yield differing and inaccurate readings. Your blood pressure is usually taken in the upper part of your arm. This method requires that you sit down and have the blood pressure cuff wrapped around your arm, which is positioned approximately at heart level. The nurse or doctor taking your blood pressure listens to the blood flow in the artery near the inner part of your elbow. In patients with high or low blood pressure, readings are often taken in both arms to get a more accurate picture. When an upper extremity is not available or is injured, a lower extremity, such as a thigh, calf or ankle, can be used to get a blood pressure reading. Once a blood pressure cuff is wrapped around your leg, the nurse or doctor listens to the tibial , or calf, artery, or the popliteal, or thigh, artery to get an accurate reading. The American Association of Critical Care Nurses recommends using the arm to get an accurate blood pressure reading whenever possible. While a lower extremity can help give a physician a good idea about blood pressure, it may be more effective to get a reading closer to the heart. How Can I Improve Poor Leg Circulation?